The power trio are back for another taste of chart success. 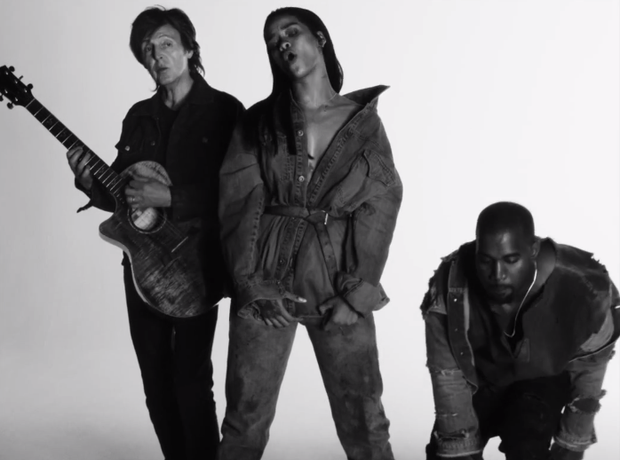 Macca, RiRi and Yeezy score a top ten place with 'FourFiveSeconds'. (We want to be a part of their crew!). The Dutch DJ has done it again. Kygo and Conrad Sewell have bagged another week in the top ten with 'Firestone'. Nothing gets us hotter than a firestone than jumping up and down to this track whenever it comes on the radio. The grime stalwart is back with another HUGE tune that you won't be able to get out of your heads. If you haven't seen the video yet, then expect to see some cameos, dancing….and chickens. NEW ENTRY. There are so many collaborators on this track we don't know where to begin. So…in 2005 Dr Kucho & Gregor Salto got together and made a track with Ane Brun. Ten years have passed and Oliver Heldens has remixed it into something special. We have another former No.1 in the house chart peeps. The flamed haired songstress took control of the chart for two weeks with this song and it doesn't look like it will be leaving the top ten any time soon. NEW ENTRY: Wiz and Charlie have teamed up to bring us a song and music video which will tug at your heartstrings like no other. The track is taken from the 'Furious 7' soundtrack which is out now.